Even if you barely know your Def Leppard from your Deep Purple, you won’t be surprised by the obvious point of this map: Scandinavia is the world capital of heavy metal music. Leaders of the pack are Finland and Sweden, coloured with the hottest shade of red. With 2,825 metal bands listed in the Encyclopaedia Metallum, the figure for Finland works out to 54.3 bands per 100,000 Finns (for a total of 5.2 million inhabitants ). Second is Sweden, with a whopping 3,398 band entries. 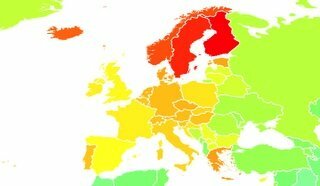 For 9.1 million Swedes, that amounts to 37.3 metal bands per 100,000 inhabitants. We confirmed our band for the Monki Gras evening party earlier. Not heavy metal, more punky that that. But The Franklys surely rock. How many tech conferences have all girl post punk bands, reindeer on the menu, and talks by top notch nordic developers about concepts like Lagom (“just enough” and the cloud) and talkoot (coming together communally to get the job done). You should come.